A multitude of inscriptions covered the facade of this house, but they were unfortunately lost in the bombardment of 1943. In the front, the house is laid out around an atrium with a basin in the centre, surrounded by the various rooms. The first cubicle on the left is decorated with full II style paintings with the name of the owner of the house, Valens, scratched into one of the walls. In another cubicle, on the right, the discovery of a casket with precious objects and ointment jars would seem to indicate that it was the mistress’s bedroom. On this side there is also a rectangular hall with birds and other animals painted on the back-ground walls. As usual, the back wall of the atrium has the tablinum at the centre with a large window opening onto the peristyle which can be reached through the adjacent corridor. 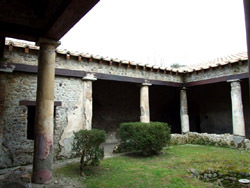 There were water-works in the peristyle and at the back of the garden, under a bower, there was a triclinium. In the southeast corner is a bath which consists of two small rooms, the first used as a tepidarium and the second, with an apse, as a calidarium. The walls of the peristyle are decorated with checkerwork painting and a graffito of the first line of Vergil’s Aeneid is found here.